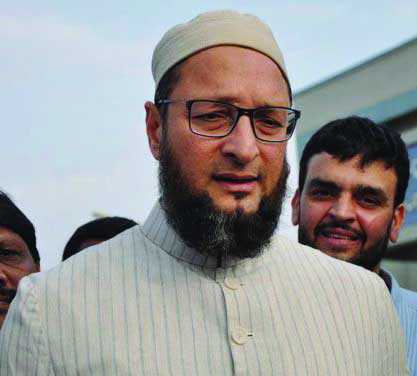 AIMIM chief Asaduddin Owaisi on Wednesday said the TRS would form the government in Telangana but his party would not be a part of the government. He lashed out at Congress president Rahul Gandhi saying he must learn humility and decency from his mother Sonia Gandhi. Owaisi said Narendra Modi, Amit Shah and Adityanath were all ganging up against him. He called himself Team “Hyderabad” in response to the Congress and BJP calling him Team “B” and “C” of the TRS. Owaisi asked Rahul how come he had become a target of his ire while all these years he was a good man when “the Congress wanted favours from him”. “Indian politics is not bipolar and there is scope beyond the Congress giving a certificate in secularism and the BJP awarding certificates of nationalism. There will be a third front comprising of regional parties that will form the government in 2019,” he said. The AIMIM is contesting eight seats in old city of Hyderabad and it hopes to win all of them. In the 2014 polls the party had won seven seats. “I’m not a tenant in India. Muslims like me want partnership in politics and society. When the British left, Adityanath and company had no choice; Muslims did and they made a conscious decision to stay back. They cannot be treated like second-class citizens now,” he said. Citing various examples, he said the BJP had failed in governance. “So has the UP government whose chief minister is on a tourism spree while cow vigilantes have shot a police inspector with his own revolver. The BJP has to be answerable to the people and I’m confident they will reject it in 2019 for failing them and dashing their hopes and expectations,” he said.